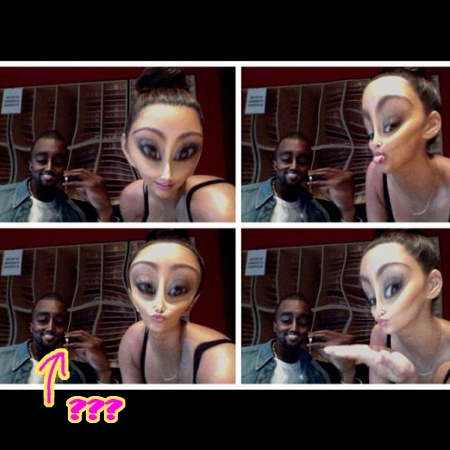 Kim Kardashian and Kanye West spent some quality time together last night pretending to be aliens and smoking, what appears to be, some marijuana. At first glance, the couple, who did some Photobooth mastery to make their heads look like aliens, appears to be having innocent fun. But as you look closer you can see that they might be having a little too much fun, as Kanye appears to be holding a small white object that looks like it might be something a bit stronger than a normal cigarette. To think that there was a time when Kim Kardashian was considered the mild-mannered one who chose to stay away from just about everything, including alcohol. Now she can be seen indulging in a cocktail every now and again and truly livin’ it up. Maybe Kanye West is getting her to loosen up a bit? Or maybe Kanye is a bad influence on this Kardashian and we should do an intervention so he doesn’t continue to *gasp* corrupt her even more. What do you think of the pics? Do you think Kim and Kanye were smoking something they shouldn’t have been smoking? Let us know what you’re thinking in the comments section below.